The President and lawmakers reacted to Donald Trump Jr.'s emails regarding an undisclosed meeting with a Russian lawyer. President Donald Trump has responded to his son's release of emails regarding a meeting with a Russian lawyer. Principal Deputy Press Secretary Sarah Huckabee Sanders read a statement from the president during an off-camera press briefing Tuesday. It said: "My son is a high-quality person and I applaud his transparency." It's worth noting The New York Times said it told Donald Trump Jr. that it planned to publish the emails and asked for his response. Trump Jr. published the emails on Twitter instead. 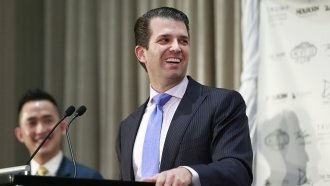 In the email chain, the president's eldest son agreed to a meeting with a person described as a "Russian government attorney" who claimed to have incriminating information about Hillary Clinton. Trump Jr. was told the information was part of "Russia and its government's support for Mr. Trump." But Sanders said she stands by her statement on Monday that "no one within the Trump campaign colluded in order to influence the election." Trump's son-in-law, Jared Kushner, and then-campaign chairman Paul Manafort are also said to have sat in on at least part of the June 2016 meeting. Rep. Elijah Cummings, the top Democrat on the House Oversight Committee, has requested that Trump Jr., Kushner and Manafort hand over all documents related to the meeting and any contacts with Russians during the campaign. And House intelligence committee ranking member Adam Schiff called the latest developments regarding the meeting "deeply disturbing." He said the panel will want to talk to Trump Jr.
"We'll certainly want him to come in," Schiff told reporters. "We'll want everyone connected with this meeting to come in. We'll want any documents that they may have." Sen. Tim Kaine, who ran against Donald Trump as Hillary Clinton's running mate, even floated the word "treason." Across the aisle, Republican Rep. Lee Zeldin said the emails "contradict" prior accounts of interactions with Russia. He called the meeting "a big no-no." But Republican Sen. Orrin Hatch told the The Salt Lake Tribune the story of Trump Jr.'s meeting is "overblown." In a statement accompanying his emails, Donald Trump Jr. said he thought the information was "political opposition research." He reiterated past statements that the attorney, who denies having ties to the Kremlin, "had no information to provide."